Students watch a 'Meet the Artists' lecture. Webster University’s Geneva campus hosted its monthly "Meet the Artist" lecture series this summer to give artists the chance to present their work and creative process to an audience from the Webster community as well as external guests. The series was co-hosted by Webster University's Global Citizenship Program, the Webster Center of Creativity and Innovation, and the Department of Media Communications, and concluded its first season in July. The artists who presented between the months of March and July included Chilean painter Marisa Cornejo, Swiss photographer Jennifer Niederhauser Schlup, British ceramicist Paul March, Danish installation artist Nina Rodin, US sound artist Marquis' McGee, and British painter Tim Young. engage with the artist about their practices. For the organizer, Julianna Sandholm-Bark, the lecture series serves important research, learning, and community outreach university goals. "Each lecture provides an opportunity to engage in a dialogue with an artist about their art-making practices, and thus enables learning and research experiences for the students, faculty, and community at large,” she said. 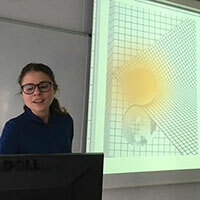 The ‘Meet the Artist’ lecture series also highlights the many crossovers that exist between the visual arts and other fields of study offered at Webster University Geneva. Read the full story and see more pictures from the lecture series at Webster Geneva. "Meet the Artist" will return in fall 2018, with a new lineup of speakers, which will be announced shortly on the Webster University Geneva Events page.